I’ve had a lab configuration project up on GitHub for a little over a year now. The idea back then was to build a bunch of scripts to allow a lab environment to self-heal from modifications made by whomever. This was fairly handy for keeping my own home lab consistent, and I later forked the code over for use at Rubrik in our engineering labs. What I found, however, was that it gets a bit clunky with time – especially trying to schedule all of the tasks – and was becoming a bit code bloated. Because of this, I thought that perhaps I could “abuse” the Pester project, which is a testing framework for PowerShell that I’ve been spending increasing amount of time learning, and get it to do my dirty work for me. After all, the framework already does a great job of iterating through a series of tests and comparing reality to the desired state. Why not have it also fix the drift? Apparently this is something people are interested in due to laziness. I’m OK with this. In a nutshell, I’ve added some try/catch code to my Pester tests. I’ve merged the refactored lab config scripts into master. If a test fails, the catch segment is invoked and remediates the identified config drift. Why do this? Because it’s my birthday and I’ll cry if I want to. I’m not all that impressed with the integration found in other config projects. I’ve isolated each type of test into its own file to make collaboration and iterative work simple. Each test pulls from information from the Config.ps1 file to understand the desired state. It then reads the variables that it needs and applies them to the Pester tests. Here’s an example from the DRS code. The remaining bits of code check for the state of something (in this case, the DRS mode and DRS automation level) and then corrects any drift. Write-Warning -Message "Fixing $cluster - $_"
As you wish. I’ve run Invoke-Pester below so that you can see the tests in action! I purposefully fiddled around with the host esx01.rubrik.demo and esx02.rubrik.demo and then ran the tests. Pester found an issue with the DNS settings, reported them, and corrected the drift. Subsequent runs will find nothing wrong because the drift has been corrected. If you use the -PassThru parameter the results will be spit out onto the console as a hashtable. Use the -OutputFile parameter to save the results somewhere. Handy for logging! Try the -TestName parameter to isolate a specific test, such as any cluster test by using -TestName "*Cluster*" as part of the command. Pester is very flexible. For those interested in going deeper, you can check out the project on GitHub or go look at Luc Deken’s vSphereDSC project (which looks waaaay more robust than my project). The issue I am seeing is if the fix also fails the test is reported as Passed. 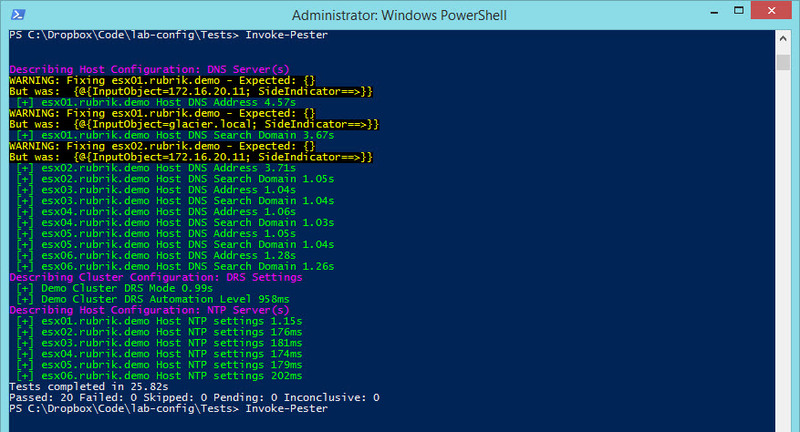 If I run the test from a non-elevated PowerShell Window it obviously cannot start the service so fails. The test shows it Passed through. Cannot open bits service on computer ‘.’. Hmm. Good point. I had brazenly assumed the task would be run with privileges. I’d propose either wrapping the fix segment in another try/catch or iterating through the test one additional time to see if it was remediated. Actually, it looks like the easy solution is to supply an -ErrorAction of Stop. It will fail the test for you.